The double cuff, also known as the French cuff, is a type of shirt cuff that folds back on itself and fastens with cufflinks. The double cuff is the most formal type of cuff after the single-link cuff, which also fastens with cufflinks but only has a stiff single layer. For the double cuff to fold over neatly, it needs to have a light and soft interfacing, either fused or sewn. A heavy or stiff interfacing won’t fold over as nicely, and the reason for the cuff folding is to give the cuff stability without the stiffness of the single cuff. Double cuffs should always be fastened in the kissing position and never overlapping like a button cuff. The formality of the double cuff makes it the standard cuff on shirts for black tie, though cocktail cuffs are also appropriate with black tie. Double cuffs are a minimum requirement for morning dress, but single-link cuffs are a dressier option. Double cuffs are also appropriate with any suit for any occasion. They pair nicely with blazers and most sports coats as well. The formality of double cuffs, however, demands a tie. They should not be worn in a casual environment. Double cuffs vary primarily in two ways: the corner style and the placement of the link-holes. Most double cuffs have a square corner. They may also have rounded corners or mitred (angle-cut) corners, and typically this describes the corner at the back edge of the cuff and not the folded edge. Rounded cuffs have the benefit of sliding through jacket cuffs more smoothly. Double cuffs may be styled in other ways, such as with a mitred corner at the fold or with a contoured back edge, but these are fussier and less traditional designs. Though double cuffs with square corners are technically the most formal, practically there is no difference. Any style of double cuff can be worn the same way. 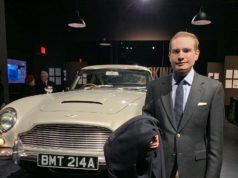 Bond has worn square, mitred and rounded double cuffs with black tie, and he has worn square and rounded double cuffs with his suits. 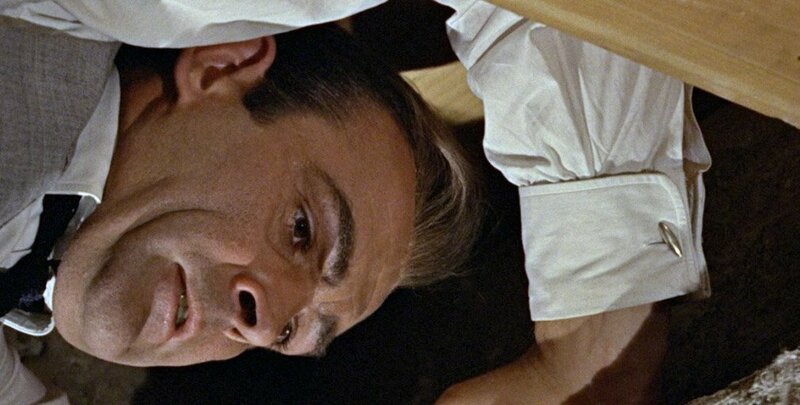 The mitred cuffs on his dress shirts in Goldfinger have unusually large mitred corners. The placement of the link-holes has varied on Bond’s double cuffs. On Bond’s British shirts from Turnbull & Asser and Frank Foster, the link-holes are placed close to the fold, which shows off the cufflinks and gives the cuff both flare and flair. On Bond’s Sulka, Brioni and Tom Ford shirts, the link-holes are centred on the cuffs. This prevents the cuffs from flaring out, meaning they’re less likely to get stuck inside a jacket sleeve. This link-hole placement has the downside of hiding the cufflinks further inside the jacket sleeves. 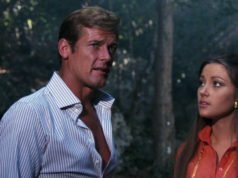 From Dr. No through Licence to Kill, James Bond almost exclusively wears double cuffs with black tie and other formal wear. Goldfinger is the exception, where Bond also wears double cuffs with his suits and sports coats. Starting with GoldenEye, Bond almost always has worn double cuff shirts with his suits as well. 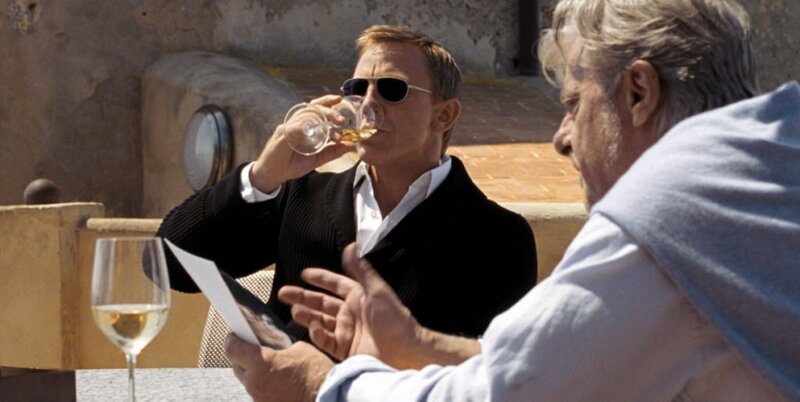 James Bond breaks the rules in Quantum of Solace when he wears a shirt with double cuffs with his shawl-collar cardigan, but the results are less than favourable. Not only do formal double cuffs clash with this casual ensemble, they bind under a snug knitted cuff. Shame on the last bit. Tom Ford makes a beautiful double button barrel cuff which would have been appropriate in, say, sky blue. (Which as pointed out before on this blog flatters his complexion better.) Perhaps they didn’t think anyone would notice, wanted to get something for one scene when one of his dress shirts could do double duty, or both. Double cuffs with dinner jackets is actually a fairly recent trend. Ask any older savile row tailor and he’ll tut-tut about the practice. Traditionally it was single cuffs (with or without links) with a DJ. I wouldn’t say the 1930s is all that recent. If it has to be double cuffs than my preference would be the rounded corner option (the other two options tend to fray quicker). And by all means they should have the right size – off-the-peg versions mostly are too big and too wide which looks sloppy. In general I think that double cuffs are a bit overestimated when it comes to judging appearance. Wearing them cannot outweigh a miserably cut suit or low-quality footwear although IMO many people believe that. In UK they are standard for business wear but – as I see it – in most of the other European countries button cuffs are more popular (Italians generally prefer barrel cuffs). I don’t know how things are in America. I myself think that cocktail cuffs are the smarter double-cuff version. An interesting subject Matt. I wonder why they chose to pair double cuffs and a cardigan in QoS. I’ve noticed Craig do this with knitwear at interviews as well. Overall, however the QoS clothing was in my opinion the best in the Craig era. either single or double button barrel cuffs, tab or cocktail. I think the French cuff with the cardigan is trying too hard. I’d imagine that it would be a bit uncomfortable on the wrist, especially with some honkin’ Rolex or Omega. I’m not sure that exact model honked, although the alarm is rather loud. I like a double cuff, me, but they can be a pain when typing. After 5 years in the custom shirt business, I can tell you there is a difference in durability of the square and rounded corner double cuff; it is based primarily upon where the layers build up, and the effects of pressing. With a traditional 1/4″ offset stitch, corners with sharp angles suffer from a buildup of more layers of material. You will notice that the corner of the double cuff is almost twice as thick as any other portion on the seam. This is an unavoidable consequence of the way a shirt is constructed. You will also notice this at the corners of squared-off barrel cuffs, as well as the points of the collar. Most traditionalists opt for rounded corners, which eliminates much of the buildup and makes pressing a less destructive effort. The modernist may opt for edge stitching, which requires less fabric and results in lesser buildup at corners, but does not look as good with traditional materials that have heft, such as flannel and tweed. Finally, a well-fitted double cuff with a cardigan was a very common look 50 years ago, when men routinely wore double cuffed shirts on a daily basis; it was a very Sinatra look as well. It is definitely something that would have been common during Connery’s era. Huh. I noticed in a previous post that Goldfinger wore double cuffs with his cardigan while golfing. I assumed that it was part of his overdressed-for-golf look. Would double-cuffs perhaps have worked better with looser, hand-knit looking cardigans where the ribbing on the cuff wasn’t so tight that it presses down the fold, like it does on Craig’s cardigan? A double cuffs would technically work better on that kind of cardigan, but the formality still makes double cuffs inappropriate. Goldfinger wears double cuffs with his cardigan because it allows him to wear gold. He’s a flashy person. The double cuff is considered not appropriate for business in many settings. The Button cuff is the norm. The level of formality in business usually doesn’t warrant double cuffs with a suit even though I sometimes wear them for regular business work days, I like cufflinks. Some would say it comes down to personal preference. But if you keep the cufflinks discrete there isn’t much of a difference really. Without scrutinizing the film, I wonder if Bond’s French cuff/Cardigan ensemble can be attributed to “making do” on account of business travel. Put aside the movie magic for the moment, and pretend Bond is an actual person, packing a suitcase. Business travelers do this kind of thing all the time. The navy suit jacket stands in for a blazer, slip-ons are worn with a suit on account of airport security, etc., etc. I don’t even think it looks bad, although I imagine the feel of French cuffs under a sweater may be a little annoying. On the other hand, an open collar, French-cuff shirt with casual pants alone, especially jeans, is a dreadful look. I can agree with the persnickety traditionalists that much! Walter, I think you are quite right. All I’ll add is my observation that I’ve noticed that Bond wears plain and unobtrusive cufflinks with his French cuffs. As well he should. I can’t stop myself peeking at men’s cufflinks and it takes me a long time to forget special or distinctive links. Not what a secret agent would aim for. I like to pair my TF black cardigan with an Anthony Sinclair white cocktail cuff shirt. I think the cocktail cuffs work better than double cuffs with the cardigan’s cuffs. What kind of shirt cuff do you like the best? I like the double cuffs the best because they are more formal, classic, and stylish. I see that when you go to a common men’s store like JcPenny’s, Macys, Van Heusen, or Calvin Klein, there are almost nothing but barrel cuff shirts. Many people are starting to shy away from french cuffs, and I don’t know why. Why is it that less and less people are wearing shirts with french cuffs? Also, is it o.k. for any shirt color to be with double cuffs? All kinds of shirt cuff have their place. Many people don’t like double cuffs because they are flashier and fussier. Any classic formal shirt colour (the light colours I mentioned to you the other day) can have double cuffs. What are your thoughts on convertible cuffs Matt? I do not like convertible cuffs. As button cuffs, there’s a visible buttonhole on the underside. As they fasten with a single button, the typically square convertible cuff will pivot on the button and the square edge will end up out of alignment. That’s why single-button cuffs should be rounded to avoid awkwardly juxtaposed corners. Convertible cuffs are ordinarily too soft to look good with cufflinks. Single-link cuffs are made stiffer and double cuffs have the extra layer to provide stiffness. Normal button cuffs are better if one has limited funds for a shirt wardrobe since they’re more versatile than double cuffs. My tailor proposes making a rounded cuff, and to make it stiffer (almost as stiff as a traditional single cuff). Would that adequately solve two of those issues? It could work. You’d want a button made like a cufflink (2 buttons sewn together) rather than sewn onto the cuff, because you don’t want a button present when wearing cufflinks (yet another problem with typical convertible cuffs).